Discover one of the Brandywine Valley’s most spectacular holiday showcases! 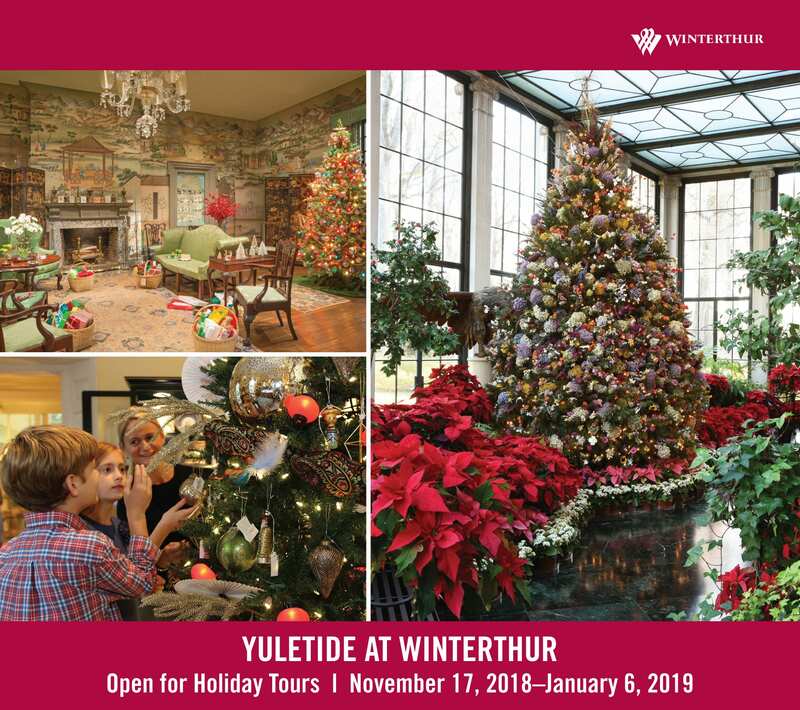 Yuletide at Winterthur embraces the warmth and festivity of the season with a magnificent holiday tour of Henry Francis du Pont’s mansion as well as breathtaking trees, dazzling room displays, a magical dollhouse, and the opportunity to shop, dine, and create new memories. Book your holiday tour! Yuletide Tour requires timed tickets. Reservations recommended. Winterthur is open on Mondays during Yuletide! Other signature displays include the majestic dried-flower tree, on grand view in the Conservatory and featuring some 60 varieties of flowers. Yuletide at Winterthur has something for everyone to enjoy! Kids of all ages will delight in a magical Christmas tree inspired by Winterthur’s Enchanted Woods children’s garden; a remarkable 18-room dollhouse mansion filled with nearly 1,000 miniatures and fully decorated for Christmas; and a display of antique Santas and figures of the mischievous Belsnickel, a gift giver from German folklore who is closely related to Ol’ Saint Nick. Join us on New Year's Day as we pay homage to the tradition of the du Pont family’s annual New Year’s Calling. The du Ponts offered hospitality to those who would come to visit on New Year’s Day to exchange season’s greetings. We extend the same sentiment to all of you by inviting you to join us for a Yuletide Tour, free refreshments of hot chocolate and cookies, a free gift of a paperwhite bulb to brighten up your home, and crafts for all ages. Plan your visit today and experience a full season of holiday magic at Winterthur! For tickets and information, please call 800.448.3883. Yuletide at Winterthur is included with admission. Members free. Yuletide Tour reservations recommended. Open New Year’s Day. Closed Thanksgiving and Christmas Day. Enjoy seasonal events and special offers, including Enchanted Winter Day, Yuletide Jazz and Wine; live, one-man performances of A Christmas Carol with Gerald Charles Dickens; brunch with Gerald Charles Dickens; Yuletide Brunch with Santa; and more! Interested in reserving a group tour? Please call 800.448.3883, e-mail tourinfo@winterthur.org , or visit the web page for tickets. Give the gift of membership this holiday season with this special offer! Connect with us on Facebook, Twitter, and Instagram @winterthurmuse and on SnapChat @winterthurmus. *Note, the promotion is not valid on prior reservations and cannot be combined with other offers.